Getting out of Israel was a snap and all the immigration officials on both sides of the border played along with stamps or lack thereof so that a trip to Syria wouldn’t be hampered with any evidence that I’d been to Israel. Any time you can take a diversion for a trip into Salt is a diversion worth taking! The enterprising Jordanian who allowed me to leave Doc at his house was playing cards with his cronies when I debarked the community bus from Jerusalem. Doc fired up and I was motoring through the Jordanian country side as I flanked the Dead Sea before turning northeasterly toward Amman while thinking once again about how the Arab world has changed since TE Lawrence led the Bedouin to victory against the Ottoman Turks. The history is mind-boggling and the more I learn here, the more I realize I don’t know nor understand. So I set my sights on Syria with a bit of apprehension. 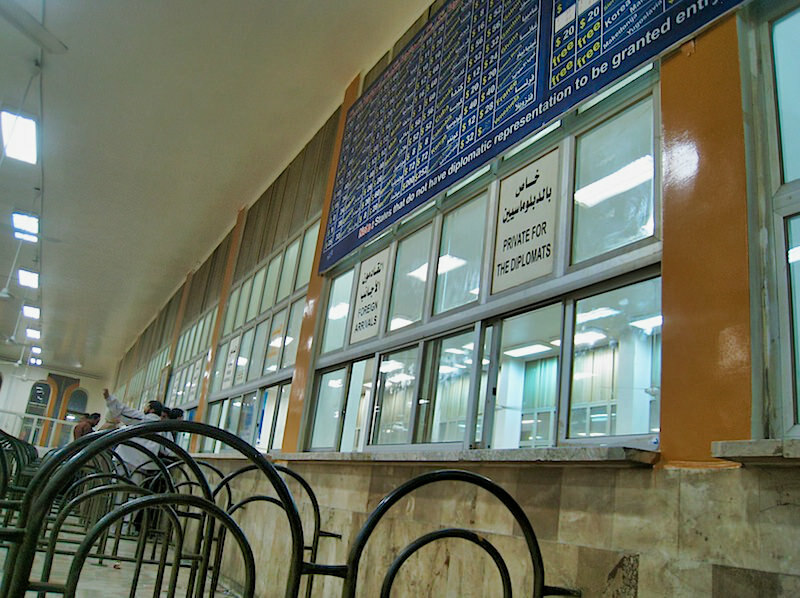 Syria has a policy that it will not grant foreign-nationals admittance into its country without a visa. Sounds normal, right? Except there policy boldly and unequivocally states that if Syria has diplomatic relations with a vistor’s home country, a visa MUST be secured from the consulate or Embassy in your country PRIOR to entering Syria. It will not issue a visa at overland borders to anyone who failed to get a visa in their home country. 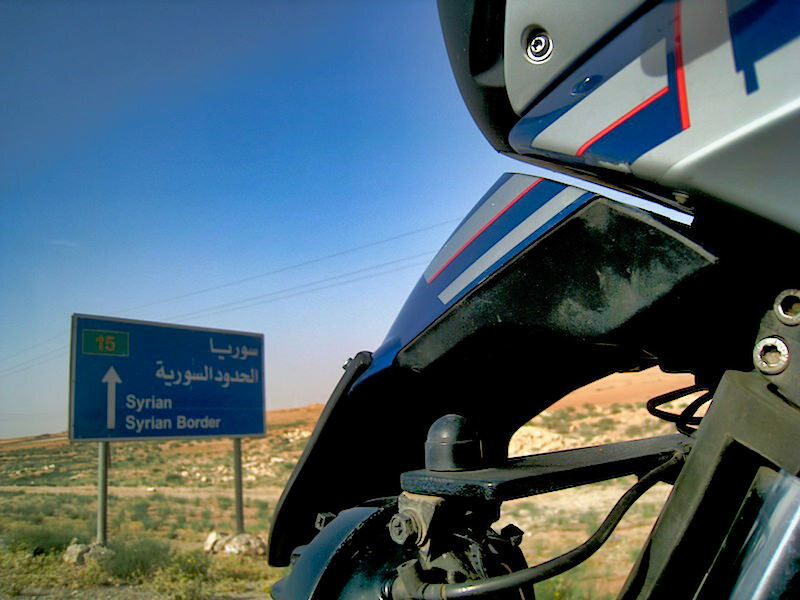 So riding the tarmac toward the Syrian border a bright red Volkswagen with a group of Syrian students passes me and cheers. When I stop to take a picture of a sign they want to know if I need help. And so the tone was set for my journey through a country with a questionable government but often misunderstood populace. At the border I attract the usual attention. Most Arabic speakers try to mutter some English words, while those with a command of the language admire the flags on my panniers. “You go to Israel?” a Jordanian asks, “you no can go to Syria when you come to Israel,” he offers. It’s then I remember that I have a few Israeli shekel shekel bills and coins in my pockets. Subversively I find hiding places on the bike. I find a brochure and tourist map from Jerusalem which would be better torn up and tossed into the trash can outside the office. Inside a huge sign in English and Arabic punctuates my fear that getting a Syrian visa might not be easy. Or worse, I might have to make a U-Turn and head back to Africa or take an alternate route around Syria. But this notion is unacceptable. I want to go to Syria. So I step up to the window while noticing the only three other white westerners in the building — a couple and their young daughter — they’re siting on benches adjacent to the window where foreigners must start their immigration process. The stodgy 60-something man with wire rim glasses and a nose that seems to have been pushed into his face. He flips through the pages of my passport in rapid motion. Once. Twice and then a third time and hands it back to me. “You no have visa. Where you visa?” He asks. “Not possible to enter no visa.” He walks away. I just stand there. Wearing taupe uniforms neatly pressed and sporting an official hat, my contact starts a conversation with another official who then walks to the window. “Where’s your visa?” the question is repeated again. I explain that I’ve been traveling for more than a year and have not had an opportunity to go back to my country to apply for your visa. “Plus,” I further detail, “when your visa must be used within 90 days of issuance, so even if I received a visa a year ago, it would be invalid today.” He grabs my passport and flips through the pages and then asks, “You’ve been to Israel?” Must be a trick question, I thought. There isn’t anything that indicates this in my passport. Or is there? “No. I have not been to Israel,” I tell him the white lie to hide my secret. He tells me to sit down and that he must send a request to Damascus, the Syrian capital. Plopping next to the young family I learn they’re British nationals who’ve been waiting four hours for a visa. I tense up and then breathe, preparing myself for a long day. It’s 12:30pm. Others tell me I can get to Damascus in a couple hours. So in order to make Damascus before sunset, I gotta be cleared through immigration and customs by 5pm. I start pacing. Check out the bike. More questions from more people. A group of Arabs in ultra white and neatly pressed gowns with matching keffiyeh, the cotton headdress and agal, a rope circlet that holds the Keffiyeh in place. There is not a stain or touch of dirt on these gowns and their shoes are clean and simple sandals. Only one speaks English and tells me they’re from Saudi Arabia. They join me on the bench and insist I come to visit their village which is less than 100km away. 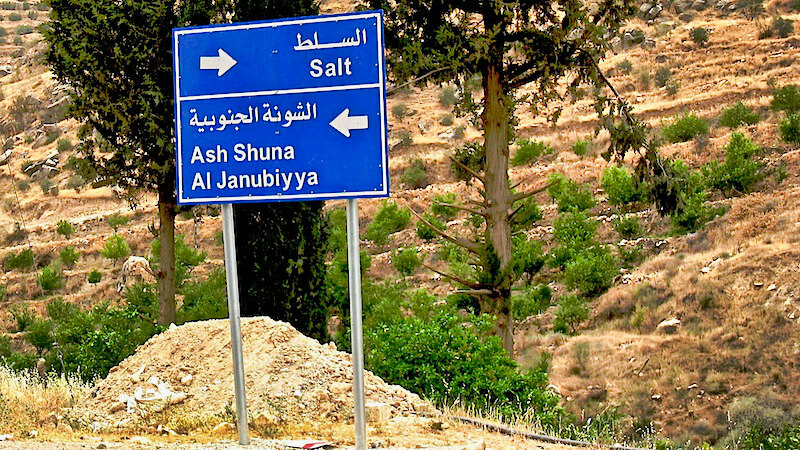 With a visa problem in Syria, I can’t imagine what it would take to get into Saudi Arabia. But I ask him to jot his name, number and address in my moleskine book. Nearby is a rather ostentatious duty-free store, on the level you’d expect to find at airports in Paris, Milan or Frankfurt. There’s the usual assortment of fine spirits and liquor, brand name clothing, electronics, cell phones and chocolate and sweets. They’ve even got French wine on shelves sharing space with Lebanese wine. I wander the shop and chat about cell phone technology with the young sales guys before returning to the immigration window. It’s 2pm. The British couple are still waiting. I’m told that they haven’t sent my request yet, but will do so soon. Great. At 4pm the British couple get their visa. I’m told to wait. It’s apparent that I will not make it to Damascus so I explore my options and learn that above the duty free shop is a hotel. Looking rather fancy, I discover it’s actually cheap. So by 7pm and still no visa, I opt to book a room. At only $30 it could be the nicest place I’ve stayed since South Africa. I’m getting hungry. And the restaurant downstairs doesn’t have a menu in English. So I just ask the waiter to make something good. I get some kabobs, a nice salad and a warm beer. Hey. At least there’s beer. At 9pm I’m back at the immigration window. My visa request was approved 30 minutes prior. Next I proceed through a maze of windows purchasing more postage-type stamps in my passport. Then I must by insurance for the bike. Customs is open 24 hours so I spend the next couple hours plowing through the simple yet complicated process of getting my carnet stamped and cleared for exiting the country. But it’s dark and I’m tired. The duty free shop is also open 24 hours. The technology guys agree that between them they’ll keep an eye on my bike. So I ride it up the steps to just outside the automated sliding glass entry doors and park dark then cover the bike. Weary and ready, I slip into new and very clean linens. Welcome to Syria. Though I’m still in Jordan. Western Wall & Temple Mount: Old Jerusalem Rings Real Tea With Syrian Officials & My Shaky Landing In Damascus.